Cancer isn't a disease. It isn't caused by a pathogen. It's a disorder. Il believe you can cure cancer when they have a vaccine for schizophrenia or Down Syndrome. Last comment, If I make it to 100, I hope I am healthy, mobile, and have all my mental faculties in order. 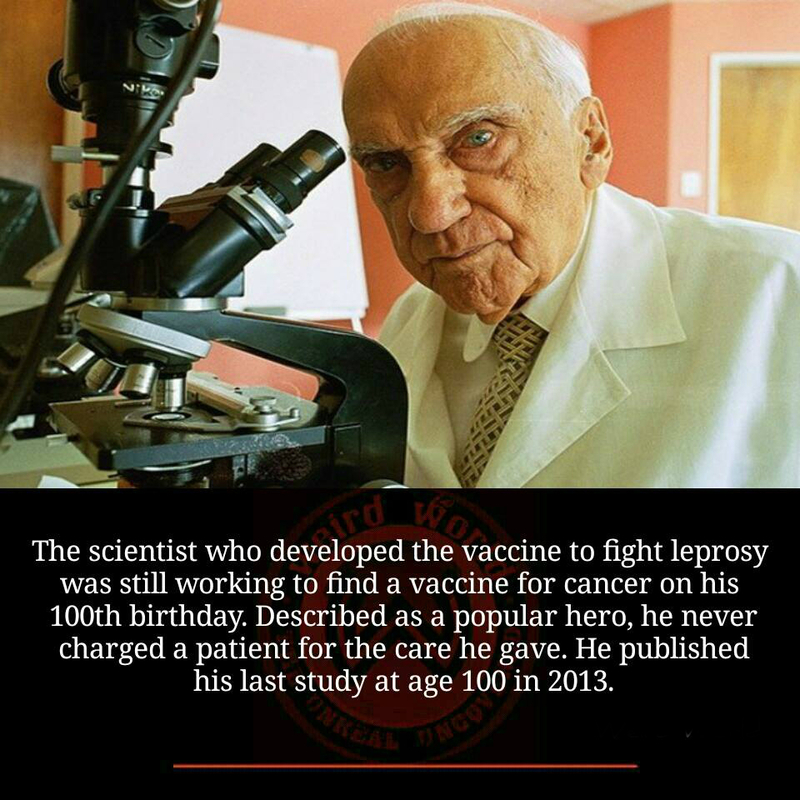 This man serves as an inspiration to others even if the pharmaceutical companies are hiding the cure for cancer. Jacinto Convit García (11 September 1913 – 12 May 2014) was a Venezuelan physician and scientist, known for developing a vaccine in an attempt to fight leprosy and his studies to cure different types of cancer. May 13, 2014 - Venezuelan scientist and doctor Jacinto Convit, renowned for developing a vaccine against leprosy, has died at the age of 100. His family said the centenarian had dedicated his life to humanity via medicine. Convit also discovered a vaccine against the tropical skin disease leishmaniasis. Leprosy has tormented humans throughout recorded history. ... For a long time leprosy was thought to be a hereditary disease, a curse, or a punishment from God. ... regimen for leprosy was developedthrough drug trials on the island of Malta. ... a vaccine and ways to detect leprosy sooner in order to start treatment earlier.